The high energy detection platforms from Andor have a long lifetime and are user-friendly. All of the systems can be integrated swiftly and directly into the core of an experimental setup. 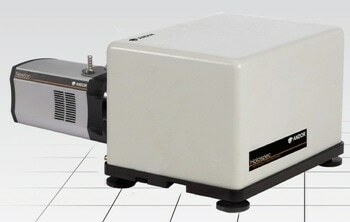 The high energy camera detection systems are suitable for a number of spectroscopy and imaging applications. Andor uses the notation ‘H’ to indicate cameras that are enhanced for detection of ‘hard’ higher energy photons. Indirect detection uses materials, such as phosphor or a scintillator, to transform incident high energy X-ray or gamma photons into photons of visible wavelength, which are detected directly by the sensor. A fiber-optic can be applied to couple the scintillator to the camera. This has many benefits such as; protection of the sensor from damage by the higher energy photons, enhancing the spatial resolution of the camera, and along with tapers, provides the ability to expand the detection field of view beyond what was defined by the sensor active area.